Carol Chatelain Young Artist Competition! KCCO’s sixth annual competition for young artists has been renamed in honor of our dear friend, the late Carol Chatelain. The Carol Chatelain Young Artist Competition gives KCCO the opportunity to engage with and support young musicians in the Kansas City area. The winner of this year’s competition winner will have the opportunity to perform with the orchestra at a world-class venue – Helzberg Hall at the Kauffman Center for the Performing Arts! The winner will also receive a cash prize of $500. This year’s auditions will take place on Sunday, March 2nd. We invite all musicians aged 13 to 19 to participate! Applications must be received by February 23, 2019. Competition audition date is: Sunday, March 3, 2019 at Atonement Lutheran Church between 3:00pm and 6:00pm (time will be assigned). The concerto competition is for ages 11-19. Perform a solo orchestral work that is no less than 9 minutes and no greater than 20 minutes in length, from memory (can be a movement from a standard concerto or a multi-movement work). Audition time slots will be up to 15-minute intervals (accompanist cuts are encouraged for the audition). The competition is open to all instrumentalists (except piano, saxophone, and percussion). First place winner will receive a performance with the Kansas City Civic Orchestra on Saturday, May 4, 2019, 3:00pm at Helzberg Hall (Kauffman Center for the Performing Arts) and a prize of $500.00. Second place may receive acknowledgement at our May 4, 2019 performance. 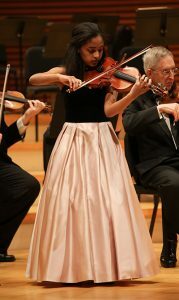 Kansas City Civic Orchestra reserves the right to have both first and second place winners perform at the May 4 concert. Winner(s) must be available for rehearsals on: April 23 and April 30 (between 7:30pm-9:30pm) and Saturday, May 4 at Helzberg Hall (between Noon-2pm.) Specific times within these rehearsals will be assigned at a later date. All room/board/transportation is at the expense of the competition participant. The $25.00 application fee is non-refundable. An audition time will be emailed to participant within one week of the application deadline. Competition participants must supply their respective instrument at audition/performance. Competition participants must supply their own accompanist at audition. Judges may come from within or may be guests of the Kansas City Civic Orchestra. Winner selection will be announced and emailed at the end of the audition day. The Kansas City Civic Orchestra can decide not to award winners/prizes. Failure to abide by these guidelines and rules may result in participant’s disqualification. Feel free to contact our music director with any additional questions. Final Concert of 2018-2019: Celebrating 60 Years!